Ranu Sinha is reading for a DPhil in Geography and the Environment at the School of Geography and the Environment, University of Oxford. She holds a Master of Philosophy in Water Science Policy Management from University of Oxford (Distinction) and a Masters in Public Administration in Public and Economic Policy from the London School of Economics and Political Science. She holds a Bachelor's degree in International Relations from Bentley University in the United States. Ranu is an Indira Gandhi Scholar with the Oxford India Centre for Sustainable Development at Somerville College, Oxford. 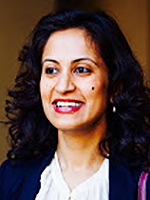 Prior to joining University of Oxford, Ranu worked as a water resources management specialist for more than eight years with the World Bank Group. She has been working with the International Finance Coroporation (IFC), 2030Water Resources Group (WRG) and the World Bank in South Asia on projects related to water sector reform in the irrigation, agriculture, and rural development sectors in the Indian states of Bihar, Madhya Pradesh, Rajasthan and Tamil Nadu as well as in Afghanistan, Bangaldesh, Mongolia, Nepal, and Pakistan. Ranu's doctoral thesis investigates whether investments in irrigation infrastructure enhance water security and welfare benefits at a sub-national scale by drawing on data from a decadal, World Bank funded, irrigation investment program in Madhya Pradesh, India. Using district-level rainfall anomaly analysis and economic modelling of household survey data, her research analyses whether irrigation investments can improve district-level crop yields and protect yields from rainfall variability. The research also examines whether investments made a positive impact on the perceived welfare of farmers and whether it influences behaviour of farmers towards more sustainable farming and water use practices. Sinha, R., Gilmont, M., Hope, R. and Dadson, S. (2018) Understanding the effectiveness of investments in irrigation system modernization: evidence from Madhya Pradesh, India. International Journal of Water Resources Development.